Home Transformation TuesdayBefore & After	Doh! A deer! I’ve been digging all of the fun resin woodland animal busts that are popular these days, but let’s face it, these are a trend and not worth the $100+ most retailers want. When I got an email that I had a decent sum of expiring eBay bucks, that somehow lead to a purchase of this…buck. And also Chloe’s mini elephant bust. If you strike out with or don’t like ebay, you can also buy the buck here and mini elephant here. Now, let’s clarify that I like the white and/or metallic busts, not the realistic ones. However, I couldn’t argue with only a few bucks out of pocket for the two busts for the realistic ones when I always have plenty of spray paint on hand left over from other projects. I had to quickly spray paint this guy so he’d stop staying at me with those dark, creepy eyes. I used Rustoleum High Performance Enamel in flat white (my go-to) and the Krylon Chrome that I used to update our kitchen door push plate. The results were just what I wanted! The antlers come off easily and I spray painted them seperately. It took a ton of thin coats of white for good coverage with all of the nooks and crannies of the fur detail. Oddly, my husband asked if he could have a plain one for his man cave. We’ll have see about that one. I’m not sure I want a faux buck head staring at me while I’m watching Bambi with the girls on a quiet day. 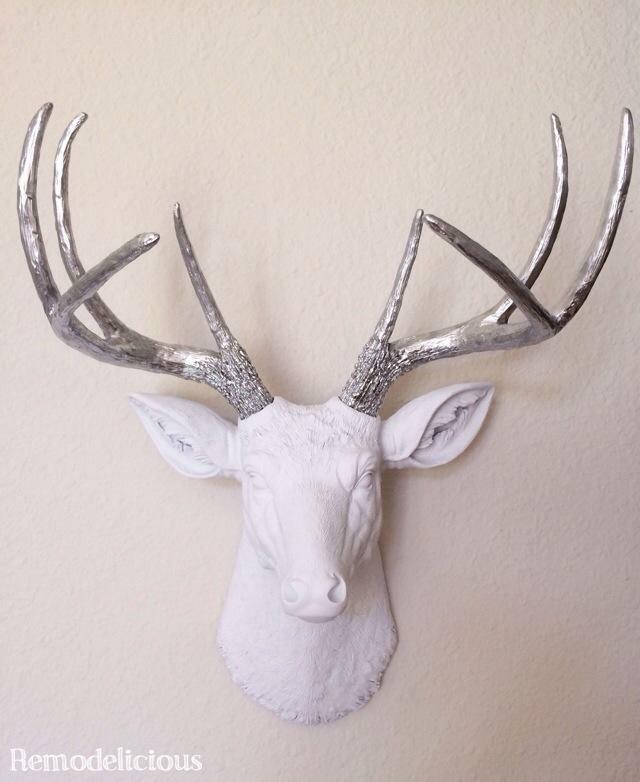 If you’re not up for a project, there are white faux deer busts available on amazon.com for under $100 here and here. They are the same deer head painted for you.